First-year Wyoming football coach Craig Bohl said his team “utilized its bye week wisely” last week. The team practiced a good part of last week, and much of that work was getting ready for Saturday’s home-finale against Boise State — a team UW has never defeated in eight games and has been outscored 148-43 in three home games. UW enters the game 4-6 overall and 2-4 in the Mountain West. It needs to win its final two games to get to 6-6 and become bowl eligible. Boise State is 8-2, 5-1 and if it wins out it will win the league’s Mountain Division. A few weeks ago, some UW fans wanted to see what else Wyoming had at quarterback besides senior Colby Kirkegaard. The Cowboys’ offense was sputtered in its first seven games. There were glimpses of good, but too many three-and-outs and empty drives. Some wanted to see what UW’s backups could do, even if it were for a series or two to see what the future of the program may look like at quarterback. That talk has quieted after UW’s 45-17 win at Fresno State last week. The Cowboys recorded numerous season-highs offensively, including points, total yards (694), rushing yards (374) and third-down conversions. But going back to UW’s 27-20 overtime loss to San Jose State, Kirkegaard has not thrown an interception in his last three games, and over the last two he’s completed 68.1 percent of his passes for 655 yards and four touchdowns. Sophomore back up quarterback Tom Thornton has seen mostly mop-up duty for the Cowboys this season. He’s played in two games and not attempted a pass. 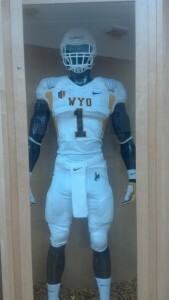 Sophomore Aaron Young, the No. 3 quarterback, has not played. Vigen said it’s a 2-to-1 ratio in terms of the number of reps Kirkegaard receives each week during practice compared to Thornton. For more on UW’s sudden offensive surge, see Wednesday’s Wyoming Tribune Eagle and Laramie Boomerang, and log on to wyosports.net. First-year Wyoming football coach Craig Bohl began his Monday news conference like he has the others this season — giving a quick recap of the previous game. And he said the Cowboys’ 45-17 win at Fresno State last Saturday was his team’s most complete game in all three phases of the game this season. One question asked by the media that wasn’t on the video was about if there was renewed enthusiasm among the players after the win, and if thoughts or goals of getting bowl eligible with two more wins were being talked about. Bohl said that hasn’t been an emphasis this season, and that the only goal this team has is to prepare to host Utah State Friday night. Another good thing that came from the Fresno State game was no new injuries. However, Bohl said senior defensive ends Sonny Puletasi (leg) and Riley Lange (concussion), along with senior safety Jesse Sampson (knee) remain day-to-day. None of those three practiced Monday. UW defensive ends coach AJ Cooper wasn’t optimistic that Lange would play this week. The news was expected, but still bad nonetheless. Wyoming football coach Craig Bohl said prior to Tuesday’s practice that senior outside linebacker Mark Nzeocha is “extremely doubtful” to be back this season because of a knee injury suffered in the first half in last Saturday’s 27-20 overtime loss to San Jose State. Nzeocha leads UW with 59 tackles, and also was one of the team’s better players on special teams. Nzeocha joins senior free safety and co-captain Darrenn White as defensive starters lost due to knee injuries. And, you can make a strong point that both guys are the two most important players on UW’s defense this season. Nzeocha is a four-down linebacker who is good against the run and the pass. He played middle linebacker in nickel situations this season. White was the quarterback of the defense making calls and also making sure guys were lined up right. The two combined for 101 tackles, six pass break-ups, two fumble recoveries and two forced fumbles. On Sept. 8, 2012, coach Craig Bohl took his North Dakota State team into Colorado State and beat the Rams 22-7. That was the second game for then first-year Colorado State coach Jim McElwain, and the first of six straight losses for the Rams as they finished 4-8. A little more than two years later, Bohl will take another team to Hughes Stadium in Fort Collins. 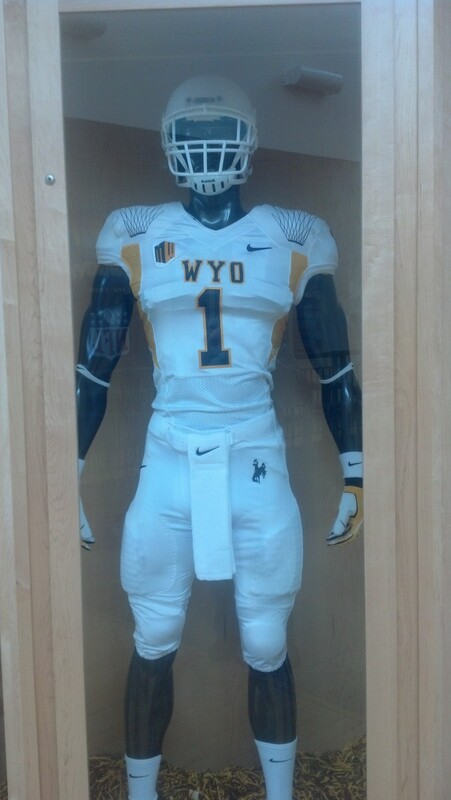 This time as the first-year coach at Wyoming. While some of the Rams’ players and coaches will be the same, Colorado State is a much different squad. Different in the fact that it is the hottest team in the Mountain West. The Rams have won five straight games, are 6-1 overall and 2-1 in the conference and became the first bowl-eligible team in the MW after its 16-13 home win over Utah State last week. The Rams also have won 12 of their last 15 games dating back to last season. “They’ve made great strides with the program and it will be a big challenge,” said Bohl during his Monday news conference. “You look at their quarterback and (senior Garrett) Grayson’s a guy who’s played an awful lot of football; he’s got 27 starts. He’s throwing the football well and he’s got a great touchdown-to-interception ratio (16 touchdowns, five interceptions). He’s operated the offense very well and I’ve seen significant improvement in him personally the last couple of years. Most of the time, quarterbacks are off limits in terms of being hit during practices or scrimmages. Not Saturday for the four University of Wyoming quarterbacks in the Cowboys’ second scrimmage of spring drills. Quarterbacks were live, and did take some hits. Redshirt senior Colby Kirkegaard was 8 of 12 for 126 yards and a touchdown to senior receiver Keenan Montgomery. Kirkegaard’s long pass was 50 yards to Montgomery. Stratton said he didn’t remember who hit him, but Kirkegaard remembered his first hit by senior linebacker Mark Nzeocha on a run up the middle. Kirkegaard had ice on his right throwing shoulder after the scrimmage and during interviews with the media, but he said he does that after every game and practice. Sophomore Aaron Young was 3 of 12 for 28 yards, and sophomore Tom Thornton was 4 of 5 for 45 yards and a touchdown pass to sophomore receiver Jake Maulhardt. There were not a lot of surprises — good or bad — Wednesday as Wyoming received 19 national letters of intent from recruits to go along with the three players that already signed and are enrolled in school. First-year coach Craig Bohl said when he was hired in December that he and his staff would recruit and sign players that were “above the line” that could play in the Mountain West. “We thought if we could reach 20 that would have opp to play in the Mountain West, and not just play but win the Mountain West, we would have done well. We reached 22 guys,” Bohl said. Bohl added UW could add a player or two in this class if the opportunity came up, but said the right players at the right positions would have to surface for that to happen. “There is a purposeful reason why we are at 22,” Bohl said. UW had its class wrapped up before noon. There was some drama as Snow College (Utah) defensive back Lee Crosby picked New Mexico over UW. Kind of ironic that the UW men’s and women’s basketball teams play New Mexico tonight, isn’t it? A couple of other guys UW was recruiting also choose different schools. Athlete Jay McIntyre of Colorado, son of Colorado coach Mike McIntyre, will play for his dad and the Buffs. Receiver Ronald Nash Jr. from Iowa stayed home and signed with Northern Iowa. UW did not sign a receiver in this class. Not a huge surprise since it returns seven receivers that caught passes last season, including three of its top four guys: Senior Dominic Rufran, sophomore Tanner Gentry and senior Jalen Claiborne. Bohl said a “program-changer” receiver did not emerge in this class, and also said what UW currently has didn’t make receiver a top priority in this class. Here is the breakdown position-wise in this class: QB (3), OL (3), TE (4) DB (4), DE (3), DT (2), RB (2), LB (1). Wyoming football coach Dave Christensen was asked how his team’s confidence is Monday after it lost its fourth straight game, 48-7, last Saturday night at Boise State. UW’s top goal, and really its only goal left this season is to get bowl eligible. At 4-6 overall and 2-4 in the Mountain West, UW needs to beat 0-10 Hawaii at home Saturday and win at 6-4 Utah State next week. The Cowboys first need to worry about beating a Hawaii team, that despite being winless has lost four of its game by one score. Christensen said the Rainbow Warriors are big on defense, and there are some weapons on offense, in particular junior running back Joey Iosefa, a 6-foot, 240-pound bruiser, who had 150 yards and a touchdown in Hawaii’s 28-21 overtime loss to San Diego State at home last Saturday, and senior receiver and return specialist Chris Gant. 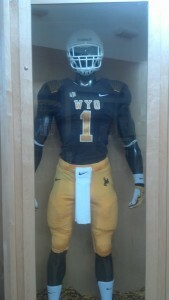 Bill Young, Wyoming’s new quality control staff member in football, got to Laramie Sunday and was quickly put to work. “I was up at 3:45 a.m. (Monday morning) because Jamar is a worker,” Young said with a laugh about interim UW defensive coordinator Jamar Cain. Part of the reason Young was up that early is because UW practices during the morning hours this season. The long-time defensive coach and defensive coordinator at the college level attended UW’s Monday morning practice. So what exactly does a quality control staff member do? First, Young is not a full-time staff member. NCAA rules allow colleges to have nine full-time assistant coaches. Even though UW fired defensive coordinator Chris Tormey last week, it promoted graduate assistant Dwain Crawford to full-time status for the rest of the season to help cornerbacks coach Renaldo Hill with UW’s defensive backs.